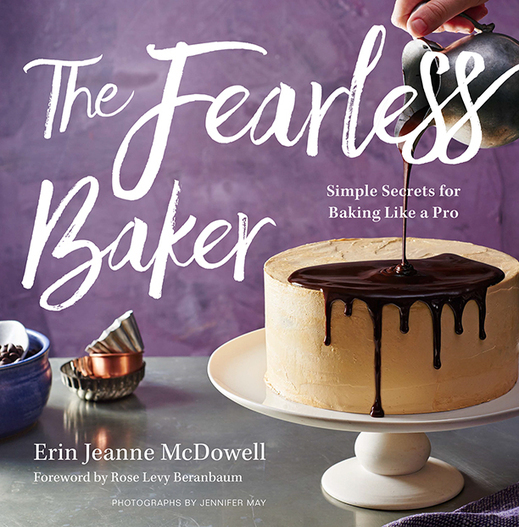 You too will be able to make this amazing pastry come Fall of this year with the launch of Erin McDowell's exciting new book The Fearless Baker! What could be harder than narrowing down one's choice of favorite cookbooks to 10, especially when the collection is well over 1000 of my own! But when Matt Cockerill, co-founder of the site 1000 cookbooks, invited me to join I didn't hesitate. The easiest way to come up with my 10 choices was to see what rose to the top of my memory. And I listed them in alphabetical order. These are the books that I've used the most often over the years. 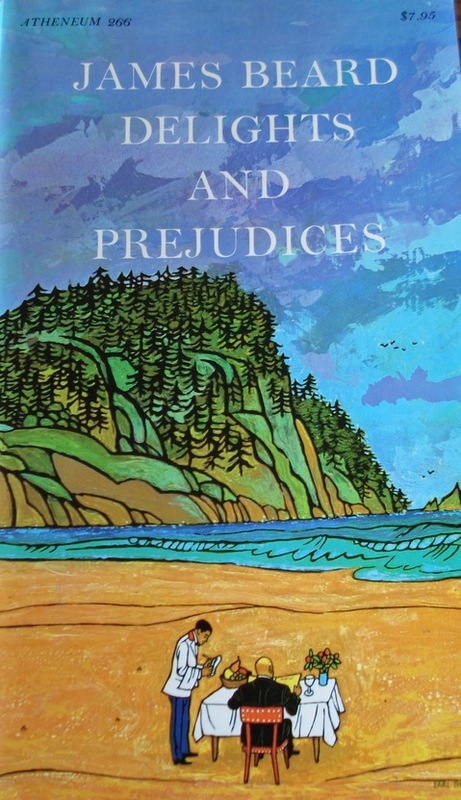 They are well written, imaginative, reliably tested, and have stood the test of time. 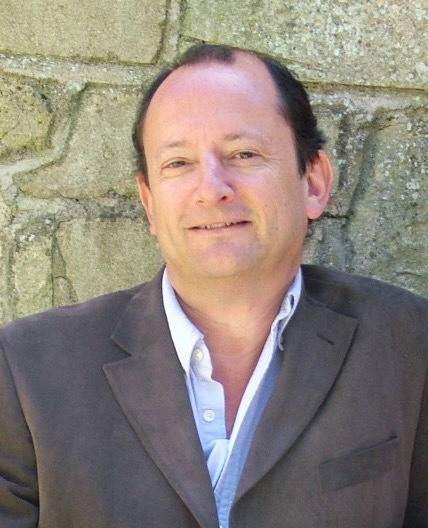 Check out the site and you will find many of your favorite authors--more as it evolves. You will also find what your favorite authors choose as their favorites. It's absolutely addictive. I was regretful not to be listed by some but amazed and delighted to be listed by some others! You will also find out which is considered by consensus to be the best cookbook of all time. (Hint: it's not vegan!) The co-founders have very interesting backgrounds in publishing and science. I had some illuminating and delightful email exchanges with Matt and feel like I've found another kindred spirit. Check it out--you'll love it! I frequently get questions from people around the world who want to buy my books but can't find them in their local bookstores and find it too expensive to pay for shipping through book websites. Back in November I wrote the following posting: 42 years ago, I worked as a secretary in the public relations department of Reynolds Metals Company. I held the key to the storage closet that contained a huge quantity of aluminum foil and plastic wrap, and it was part of my job to send them out to the press. As a special bonus, my boss gave me the present of a series of cooking classes at James Beard. Of course I was ecstatic and made sure to add Jim to the list of recipients of the foil and plastic wrap. 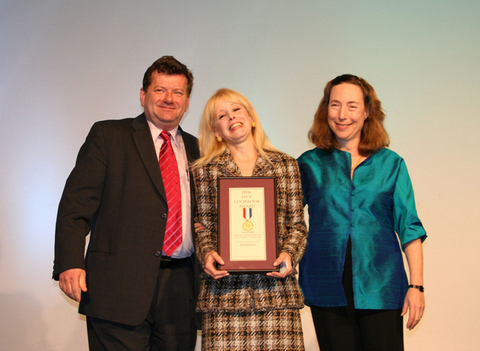 About a decade later I became one of the founders of the New York Association of Cooking School Teachers. Jim had just written another book, so we decided to hold a meeting and book signing at his home. 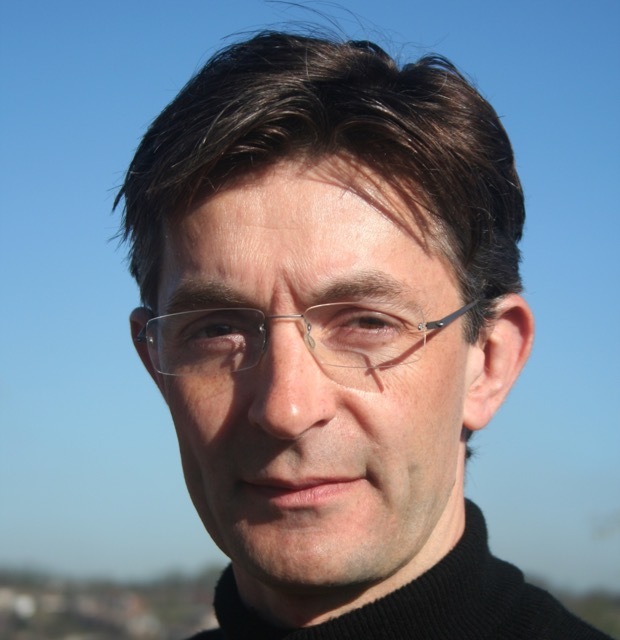 Some of us sat in chairs; I remember sitting on the floor at his feet. We were encouraged to ask questions -- I remember mine was pertaining to my dislike of ultra-pasteurized cream. Then we formed a line to have him sign our books that we had just purchased. I was very anxious to see what he would write in mine since we had a more personal relationship than most (all that foil and plastic wrap). There were so many of us, I had to wait about 20 minutes but was rewarded with a very lengthy scrawl. I went to the side of the room to enjoy it in private. To my amazement, I couldn't make out a single word of the scribble! I brought it over to Richard Nemo, who was his assistant. (I used to be able to read my boss's handwriting better than he could read his own.) But Richard said: You'll have to ask Mr. Beard; I can't read it either.! So I stood back in line for another 15 minutes, opened the book to the inscription, and said to Jim: "What did you write here?" He studied it for a few seconds, looked up, and with a half smile said: Damned if I know!After something like 32 years I finally found the book and the autograph in question! (I have well over 1000 books so it wasn't easy but I was determined.) It turns out it was just one-word--the last word--that was indecipherable. 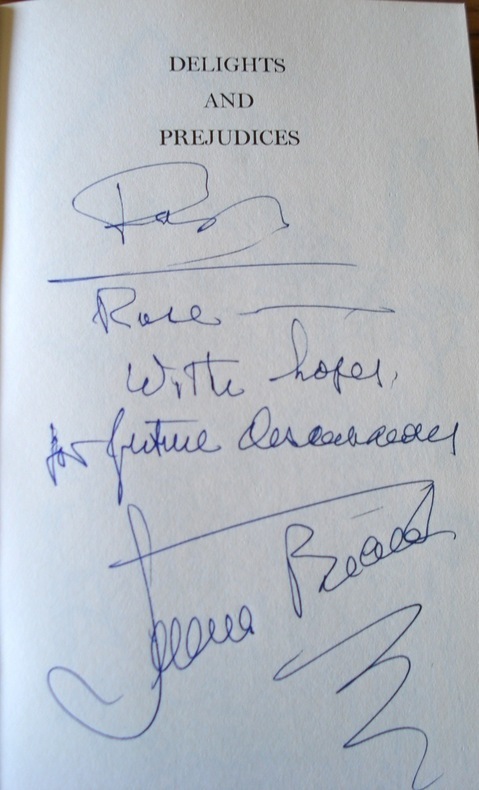 Here's a photograph of the autograph in question. See if you can figure it out. I sent it to Woody and unbelievably he solved the mystery! I'll give you a few days first to see if you can guess. And here is the very first cookbook I bought in 1962 for all of 75 cents! 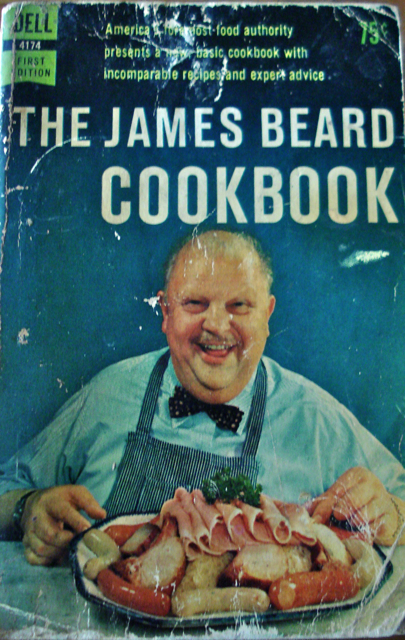 I had no idea who James Beard was but he looked so cheerful and as though he loved to eat--don't you think? 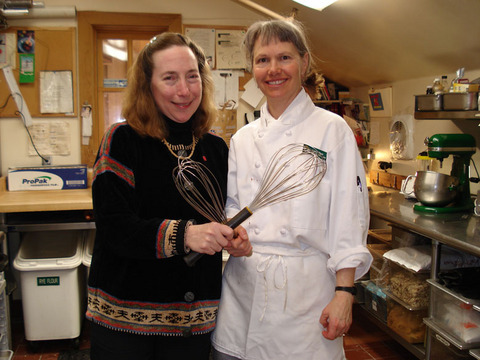 Marcy Goldman is a cookbook author, major website presence, baker, poetess, and warm generous colleague. A visit to Montréal is not complete for me without a visit with her. On this most recent visit we made an attempt to catch up over a breakfast of omelets and Montréal bagels (chewy but lighter than the NY version--see page 64 in Jewish Holiday Baking--the 10th Anniversary Edition). And we continued talking non-stop all the way to the airport. Two life-changing things Marcy shared (yes I know they are small things but I will be using them to good purpose every day and therefore are important to me) are the necessity of a small notebook, preferably Moleskine, and the pleasure of disposable fountain pens. I had just about given up on my love for writing with fountain pens after many ink leaks especially on airplanes but Marcy said this disposable variety never leaks. As for the moleskin, made famous by Hemingway, there is a little stretchable band that keeps it closed and so much love and care is put into its production it has what few cookbooks can boast--a stitched binding! 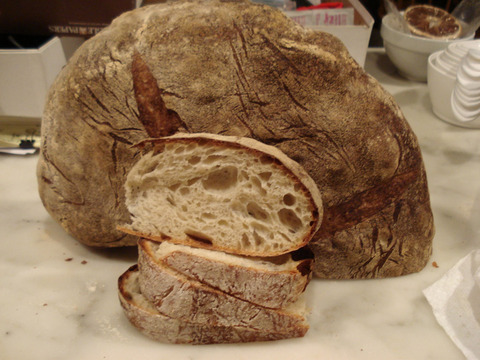 Our conversation turned inevitably to blogs, websites, and cookbooks. Marcy was a pioneer of web recipes. 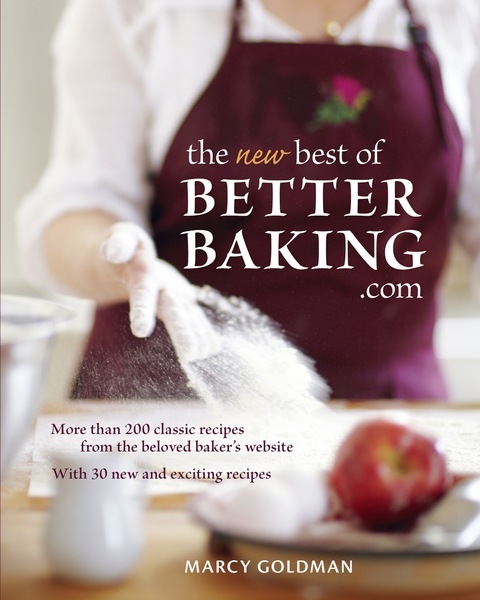 Her website www.betterbaking.com launched in 1997 and has a significant following. We talked about Kindle-type devices and having an actual cookbook to hold versus reading it on line and agreed that there's a limit to 'virtuality.' a cookbook is more than a collection of recipes--it's the soul of the writer. 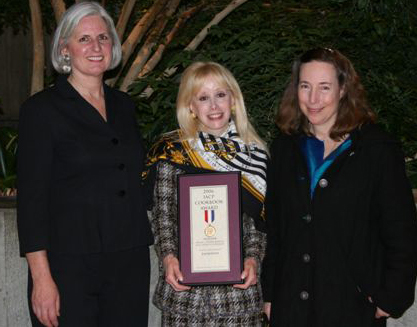 I love Marcy's books for that very reason: she puts her heart and soul into them. Beyond enticing photos, there is contextual history, fascinating personal stories, and a plethora of invaluable tips. Marcy's book, the best of Better Baking.com, based on recipes from her site, has just been re-issued with the addition of many new recipes that evolved over the near decade since its first release. 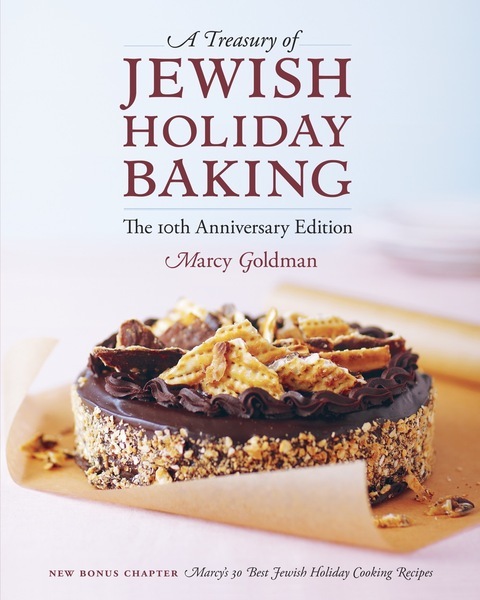 Also just out is a reissue of her first cookbook, A Treasury of Jewish Holiday Baking. This 10th Anniversary Edition contains an entire new chapter of holiday cooking recipes. At the time of this writing it already had 24 reviews on Amazon--all five star! 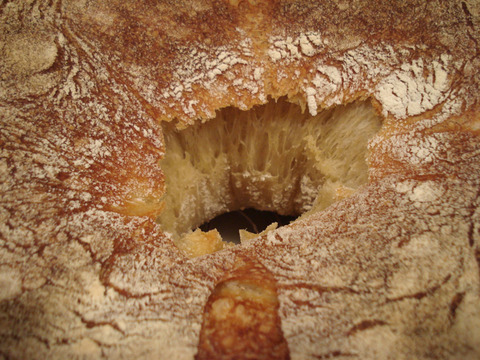 http://www.amazon.com/Treasury-Jewish-Holiday-Baking/dp/1770500030/ref=sr_1_1?ie=UTF8&s=books&qid=1258227831&sr=1-1 "So why a Jewish baking book?" I couldn't help but ask with a slight Yiddish intonation. 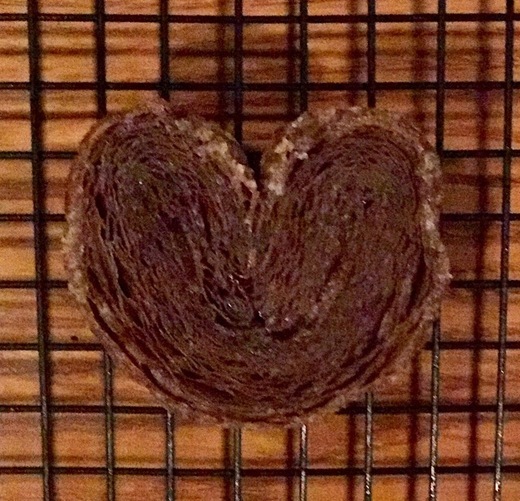 Here's Marcy's answer in her own words: "It was more a case of being Jewish, and a baker ...and being frustrated when I did Jewish food features, there was no comprehensive source. 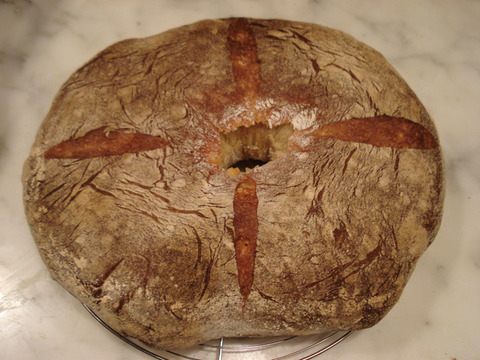 And Jewish cookbooks only included a few baking recipes and not from a baker's perspective. I figured someone should do that book. And then I realized it might as well be.....moi. But what a big book to do, espcially as my background was not so Jewish/typical, so it was lots of baking but a ton of research, and digging through recipe boxes of everyone's moms and bubbies to get definitive things and re-spin them with today's tastes, methods and ingredients, but mostly I had to invent from the ground up, keeping faithful to the recipes' soul--honey cake in particular: I was determined to make something luscious for even honey cake haters*. Matzoh butter crunch was an inspiration: It was that old soda cracker recipe but in a light bulb moment. The new cooking section makes this a complete book." *I'm one and I'm ready to be converted--I can't wait to try this recipe and many others. A New Baking Author on the BLock! 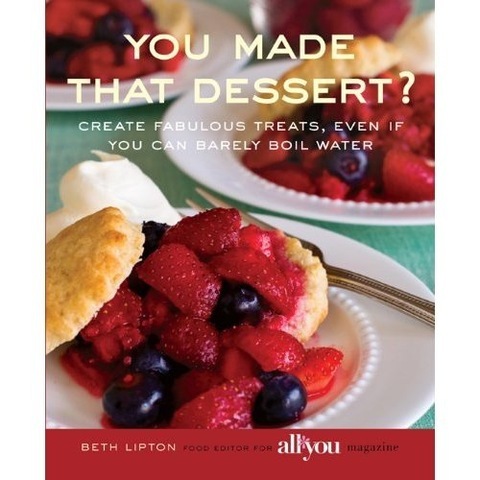 i love the title of this new cookbook and I love the author, Beth Lipton, even though we haven’t yet met except through this delightful book. At last, an author who has written her first cookbook, and even though it’s geared toward the beginning baker, is on the same page as I am concerning weights! This bodes very well indeed for the increased trend toward weighing ingredients for baking rather than the far less efficient and potentially inaccurate measuring method. Not to worry, she also lists the traditional volume. Marcel Desaulniers's New Chocolate Book! CakewalkAdventures in Sugar with Margaret Braun New York: Rizzoli International Publications, Inc, 2001 (Review I wrote for Gastronomica) I’ve always thought it a pity that exquisitely crafted cakes, which are in fact works of art, should be consigned to a medium of flour, water, sugar, and butter, that self destructs like sandcastles at high tide. I’ve questioned whether they didn’t deserve to be made in a more durable medium instead that could last for years in a museum for many more to enjoy. In fact, in Canada, Japan, and no doubt elsewhere, there is a highly practical tradition of making elaborate but reusable wedding cakes with durable decorations on Styrofoam layers with just one small section removed to hold an edible piece of cake that the bride can feed the groom, while the actual cake to serve the guests is only a backstage sheet cake. But I have to admit, that if ever there were a time and a place, or justification for the real thing, devoid of such deceit, it would have to be for a wedding celebration. Perhaps some atavistic pagan fantasy entices us to see this exquisite virginal symbol invaded and cut into to reveal it’s tender and flavorful interior. But whether real or illusionary most would agree: A dream occasion deserves a dream cake. Margaret Braun, in her book “Cakewalk,” presents a collection of breath-taking tiered celebration cakes unlike any I have ever seen. They are such exquisite works of art I’m sure people will wince in pain to see one cut. Just looking at them in print makes me want to sob with delight. Even the publisher (Rizzoli) has risen to the occasion, providing the setting this book deserves. 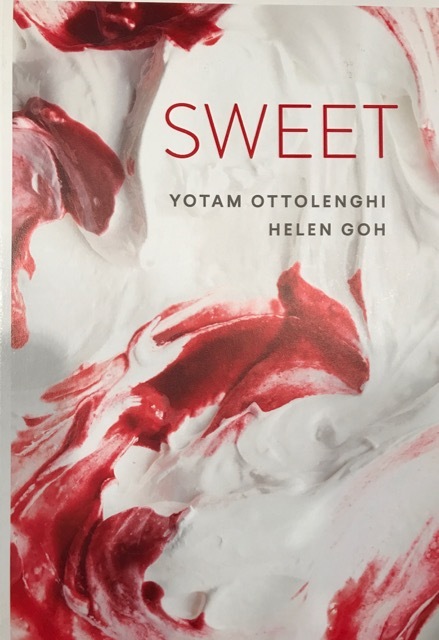 Not only is this a gorgeous four color production with stitched plinth (binding), but the proverbial icing on the cake, and unprecedented for a cookbook, it has guilt edged pages. Even most bibles don’t get this treatment! And the photographs by Quentin Bacon do these edible dream works of art full justice. Yes, this makes a fabulous coffee table book, but it is much more than that. Braun’s designs are uniquely original and she shares many of the detailed techniques to recreate their appearance. This book will provide inspiration to countless cake bakers and caterers ever in search of a “new look.” If you want to reproduce most of the actual cakes in this book, however, you will need a more detailed baking book that contains cake recipes both larger and smaller than the 10-inch ones offered here. Also, the actual instructions for shaping the layers are vague to non-existent. One interesting though labor intensive suggestion is to cut the layers 1/2-inch thick to increase the proportion of filling to cake. Of course this is a matter of personal preference. Cake lovers who appreciate their cake layer lofty and uninterrupted (and there are many) will not be pleased. By the way, don’t be surprised if your caterer cringes in horror at being asked to reproduce any of these elaborate edifices. These cakes are labors of love and require the skill of a devoted and meticulous craftsperson. But even borrowing a few of the beautiful motifs or techniques such as painting a cake with food color, or finishing it with gold dust, pearl dust, or gold leaf, will do wonders to transform a more humble design. And of course for a price you can have Margaret Braun herself recreate them. Sprinkled throughout “Cakewalk” are refreshingly unfamiliar and thought provoking quotations such as this one on symmetry: “The underlying belief was that locating the centre of symmetry meant locating the way, the truth, and the light. Aesthetic custom and theological doctrine went hand in hand. The aesthetics of proportion was the medieval aesthetic par excellence….The principle and criterion of symmetry, even in the most elementary forms, was rooted in the very instinct of the medieval soul” --Umberto Ecco Art and Beauty in the Middle Ages (1986) (p.176). There is not a lot of story telling in “Cakewalk” but what there is reveals great sensibility of style, philosophical conviction, history and poetry—a person well beyond the realm of her cakes, that one would love to know better. I suspect that she richly deserves to have been published in such a regal manner. I know that baking is often perceived as alchemy and magic, but chef Letty Flatt, who is in charge of all baking at the Deer Valley Ski Resort in Utah, really takes the cake. You have to be there to believe the wide variety and exquisiteness of the desserts she creates at altitudes as high as 8200 feet above sea level.At the Seafood Buffet, a little lower down but not much, there is a selection of about 20 different desserts and one can taste all of them as part of the buffet dinner—in fact there are those who do just that (I came close) My favorite—also Elliott’s--was the baklava batons. 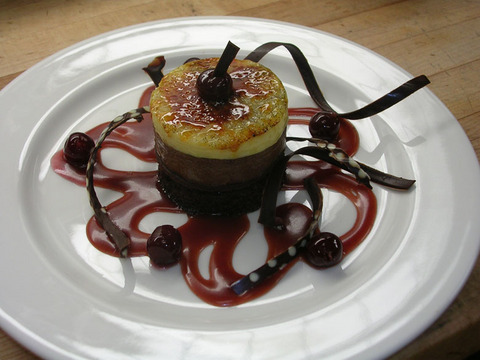 Another favorite, the Black Forest Crème Brûlée (see photo) is a magnificent plated dessert served only at the Mariposa restaurant at Silver Lake. My top favorite, which I can never resist (I returned for it twice) is the ice cream sandwich served at the Café at Silver Lake. 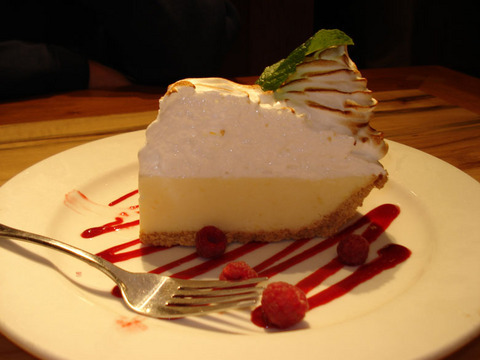 I’m usually torn between that and the Frozen Lemon Meringue Pie. (By the way, they also serve the best crawfish bisque I’ve ever tasted anywhere including New Orleans and an astonishingly good Caesar salad—both of which required a revisit as well.) 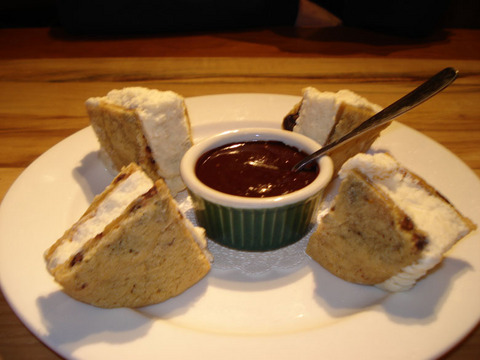 The ice cream sandwich consists of perfectly creamy vanilla ice cream sandwiched between two terrific chocolate chip cookies, cut into 4 wedges, and served with a little pot of hot fudge sauce for dipping (oh bliss). Happily the recipe is in Letty’s cookbook “Chocolate Snowball.” No wonder she recently was cited in Salt Lake Magazine's Dining Awards as Best Pastry Chef in Utah 2006! I used to think I had to go to Europe to eat well at a ski resort but not since we discovered Deer Valley. Now we just keep going back. Usually we stay on the mountain for dinner as the choices are so varied and excellent, but it’s well worth going into Park City—just about 15 minutes away-- to eat at Wahso—a wonderful Asian restaurant with equally appealing décor. In addition to the great food and staggering beauty of the mountains, we really enjoy the genuine friendliness of the people. Last year, when I wanted to try out snow-shoeing, one of the shop keepers loaned me not only a pair of snowshoes, but also his own gaiters to keep the snow out of my shoes, as none of the stores had them for sale. There was tons of snow and blue skies this year but I actually forewent a day of skiing for the pleasure of hiking with my friends Letty and Julie Wilson (the director of food and beverage at Deer Valley Resort) who led us up the Sun Peak Trail for an unforgettable experience. It was a rigorous one hour uphill climb on a narrow snowy trail surrounded by pines. I couldn’t chat much as I was too occupied with catching my breath, but it was well worth the effort because the summit gave us a panoramic view of the Canyons ski area that was absolutely breath-taking (in every sense!) Deer Valley was the dream creation of Stein Erikson—the great ski hero whose elegant style--rear end improbably extending at near right angles from one’s hopefully parallel skis--everyone tried to emulate when I started skiing back in 1961. He still skis every morning and word had it he skied with Dr. Ruth the week we were there. It was probably was more than a rumor as I spotted dear Dr. Ruth at Kennedy airport waiting for her baggage while we were waiting for ours. But by far the most serendipitous moment of the entire week was discovering at almost the very end of one of the rides up the mountain that the familiar looking person sitting next to me on the lift was the editor of Real Simple Magazine. Disguised as we were by our ski apparel it took that long to realize we recognized each other! I’ve seen her countless times on the Today Show and she’s been baking out of my books for years! Out of 1400 people on the lifts it seemed unimaginably improbably that we should be sitting on the same lift chair. Most delightful was that before I realized it was Elizabeth Mayhew I was charmed by her sweet friendly personality—just the same as she is when she appears on the Today Show. Before we skied off down the mountain Elizabeth invited me to appear on her new PBS show and I invited her to the press party for the launch of the new Gold Medal artisan style flour (more about this in June!). Life is good! Yes, the Flaky Cream Cheese Pie Crust on page 29 of The Pie and Pastry Bible. I now make it with heavy cream replacing the water and it is more tender and flavorful. DIANNE QUESTIONI wanted to bake your white chocolate whisper cake but use a tube pan instead of the round cake pans. Is this possible and what do I need to know to make this work? 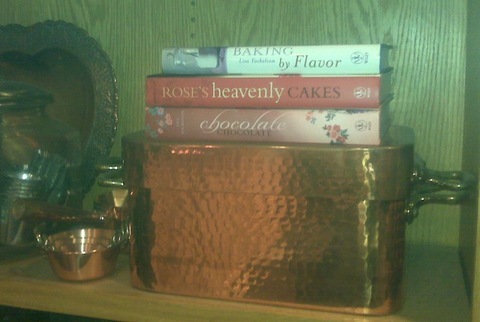 ROSE REPLY on page 455 of the cake bible is a chart listing the volume of most cake pans. of course if you have an odd-shaped pan you will need to measure the volume yourself by pouring water into it. if it's a two-piece pan first line it with a clean garbage bag. compare the size and volume of the pans specified in the recipe to the one which you want to use and then either increase or decrease it proportionately. a cake in a tube pan will take longer to bake than in a 9 x 2 or 9 x 1 1/2 inch pan but use the usual tests of springing back when touched lightly on top and a cake tester inserted in the middle between sides of pan and tube comes out clean. KIM QUESTIONI have a question about augmenting your White Chocolate Whisper Cake for use in my friend's wedding cake. Is there a rule of thumb I can go by when converting any of your cakes to larger or smaller sizes? I hope to achieve the larger volume of the recipes you've designed in your wedding cake section of the Cake Bible. The tiers are slightly higher and more dramatic than the recipes from the butter cake chapter. Thanks so much, As always, your devoted fan, Kim ROSE REPLY In my new book I plan to work on creating recipes for larger cakes based on favorite smaller ones. It can sometimes taken many tests to get it right. One of the cakes I've planned on is the white chocolate whisper cake! I think that's one that won't require much adjustment. You simply need to decrease the baking powder in proportion to the amount of flour as indicated in the charts in the wedding cake section. Do let me know how it works for you so it will give me a leg up on my recipe testing!